I recently blogged that I had received email notification that one of my photographs from Antarctica had been selected as a finalist in the 2012 Outdoor Photographer of the Year ‘Spirit of Adventure’ category. This was the first time I have entered Outdoor Photographer of the Year and I was thrilled to have been selected as a finalist. I was subsequently very humbled a few days ago to receive news that I had not only been selected as a finalist, but had won the 2012 Outdoor Photographer of the Year competition in the ‘Spirit of Adventure’ category. The winning photograph was shot on my last expedition to Antarctica and was of mountain climbers nearing the summit in rapidly deteriorating weather. It was photographed from the deck of the Ocean Nova with a 300mm F2.8L IS lens at F7.1 1/2500th of a second hand held with the Canon 1DMKIV. The announcement of my win was officially made on the 16th of January on the Outdoor Photographer of the Year website and will also appear in the March issue of Outdoor Photography magazine. There was an awards ceremony on Saturday the 19th of January at the Outdoors Show in ExCel in London. An exhibition of all the finalists work, including my own winning photograph was on display from the 17th – 20th of January. I am told the quality and quantity of images entered was exceptional across all categories. Unfortunately I was unable to attend the exhibition and awards ceremony due to other commitments. If you stopped past please let me know what you thought. I admit to feeling really inspired and re-invigorated with the news and am very much looking forward to returning to Antarctic this November. 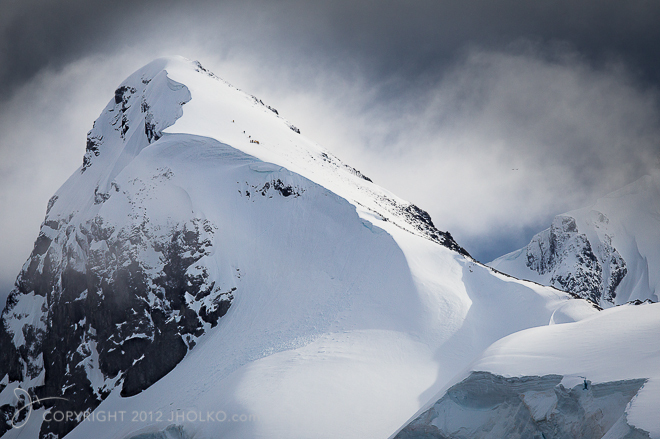 A higher resolution version of this photograph can be seen on my website in the Antarctica Portfolio.